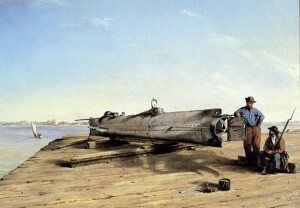 H.L Hunley: ‘Gotta See it! Painting by Conrad Wise Chapman, circa 1863. Courtesy of the Museum of the Confederacy. When Clive Cussler found the Confederate submarine, H.L. 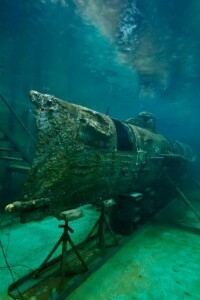 Hunley in 1995, he put another notch on his belt of historic shipwreck discoveries. And what a notch it became! The 40-foot-long maritime marauder had eluded Cussler and dozens of others who played the Hunley hide and seek game for decades. When the chase ended, the adventure author and shipwreck seeker followed through as always…he turned his find over to the state. Now, South Carolina, through an agreement with the U.S. Navy, houses the Hunley in a spacious building at the Warren Lasch Conservation Center in the old Charleston Navy Yard. The museum, open only on weekends, is located at 1250 Supply St., about a 20 minute drive from downtown Charleston. In my book, it’s not a bucket list attraction. It’s an event and you ‘gotta see it ASAP! My wife, Cathy, and I accompanied by a dozen other visitors and our guide, Bill Billingley, climbed the steps in the tank room to the platform that affords a birds-eye view of the first submarine to sink an enemy warship. “Amazing, absolutely amazing,” was all I could think as I pictured eight sailors jammed into this sardine can that was to take on the Housatonic, a Union sloop-of-war that sported 12 cannons. Sitting in a custom-built tank filled with crystal clear fresh water that’s monitored daily for ph, temperature, chlorides and oxygen, the small boat appears vulnerable. Yet the metal remains dense and will maintain its strength as the salt is leached out in the continuing stabilization process. Several sections of the upper hull plates were removed by drilling out the rivets. This allowed scientists to study the contents and visitors to see the hand cranks and heavy iron crank shaft that turned the propeller. As part of his imaginative insight, inventor Horace Lawson Hunley—for whom the sub was named—designed a 22-foot-long iron spar that acted as the boat’s torpedo. Mounted on the bow, it had a barbed point and a canister filled with 135 lbs. of black powder. On February 17, 1864, the attack was successful as the barb found its mark and the powder did its job. The Housatonic sank within minutes of the explosion. The Hunley, discovered outside the entrance to Charleston Harbor—not far from the encounter—never surfaced. The crew’s bodies were found at their duty stations, suggesting there was no emergency prompting a scramble to escape. Although it remains a cold case, one theory is they died from anoxia: oxygen deprivation which can happen fast in a confined space. Although the heroes never returned to get their accolades, they received an honorable burial. Visitors could spend the good part of a day perusing all the exhibits, while taking an intermission to catch two films about the Hunley. Literally thousands of artifacts were retrieved from the sub: buttons, bottles, pins, pipes, thimbles, coins lucky charms and more. It was common in those days for sailors to carry a lucky piece, Dixon’s gold coin being a prime example. 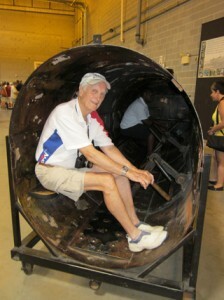 I experienced a prime example of hard work when I boarded a mock-up of the sub on display in the large hall. Perched on one of the crew’s hard wooden benches, I used two hands with a strong grip to turn the crank that that was used to spin the propeller. I discovered in short order what a labor intensive task it was in cramped quarters where candles provided the only available light. Graphics cover the museum walls depicting the origin of the sub, its construction and a bio of its inventor. Storyboards analyze the skeletal remains that were recovered and the archaeological investigations still being conducted today. Audios describe the restoration process and intricate plans that led to the raising of the Hunley in August, 2000. Children love the interactive exhibit where they climb down into a Hunley mockup as if they’re preparing to go to sea. A glass case unfurls Harry Pecorelli’s dive suit. He was the first person to touch the first successful attack submarine that sank over 100 years ago. In August, 2000, Pecorelli—an archaeologist as well as a diver on the project for several years– was on board a boat near the wreck site, celebrating the raising of the vessel. Accompanied by his discovery team members Ralph Wilbanks and Wes Hall, he was amazed at the hundreds of pleasure boaters and media reps that watched and waited for the recovery. Meanwhile, Cussler was aboard one of the press boats and as the Hunley came up he spotted his buddies, leaped into the water fully clothed and swam over to join them. When asked about it later, the famous writer with a wry grin mused, “There’s life in the old dog yet!” A chorus of fog horns and cheers arose when the barge’s crane brought its prize to the surface. Later, studies revealed the Hunley incorporated much of the technology used in our modern-day submarines including: ballast tanks, planes and forward and aft conning towers. The little sub didn’t receive much publicity over the years until it was discovered and raised. That’s when people realized how much it changed the course of naval history. For further information or to make a contribution for further research and restoration, contact Raegan Quinn at the non-profit group: www.hunley.org. This article I would rate as one of your “top ten”……interesting, factual, and well-written. I have to confess that I’m a fan of your articles and I eagerly await the next one. Thanks for keeping us informed about these interesting and exciting wrecks! There is nothing, in my opinion, better than sitting down and reading an article that gets the juices flowing like this one has. Fascinating and informative Professor. Sorry to have dropped off the map for so long I will send you pictures of the Maritime Fest at the Foss Museum on the 24th & 25th. We will be firing the 3 inch bore, 500 pound Nisqually Carronade off the dock at hourly intervals on the first day. Thank you so much. I appreciate your kind words. I truly believe that anyone interested in the Civil War, shipwrecks, or history in general should try to make plans to visit the museum and see the submarine resting in its fresh water bath. The story really comes to life as the guide relates it and gives an update on the current preservation strategy. Thanks again. E. B. What an interesting article. I didn’t realize the Hunley was being preserved in a museum in Charleston. I am planning a trip to Charleston in the fall and I will be sure to see it. Thanks for the heads up. Would like to buy a magazine about ships that you found,history of ships,marine archeology on sunken ships.